Valued for thousands of years for their fruits that are eaten fresh and used to make wines and preserves, grape plants (Vitis spp.) need a strong support system for their vines and heavy clusters of fruits. Although grapevines will grow on practically any strong support, such as a tree or arbor, they're usually trained on 5- to 6-foot-high trellis systems for ease of harvest. Grapes commonly grown in the United States are American or fox grape (Vitis labrusca), which is hardy in U.S. Department of Agriculture plant hardiness zones 3 through 9, and European grape (Vitis vinifera), hardy in USDA zones 5 through 9. High-tensile galvanized wire has the strength to support a heavy crop. Locate a site for the grape trellis, ensuring the location receives full-sun exposure and, if possible, the trellis can point in a north-south direction. 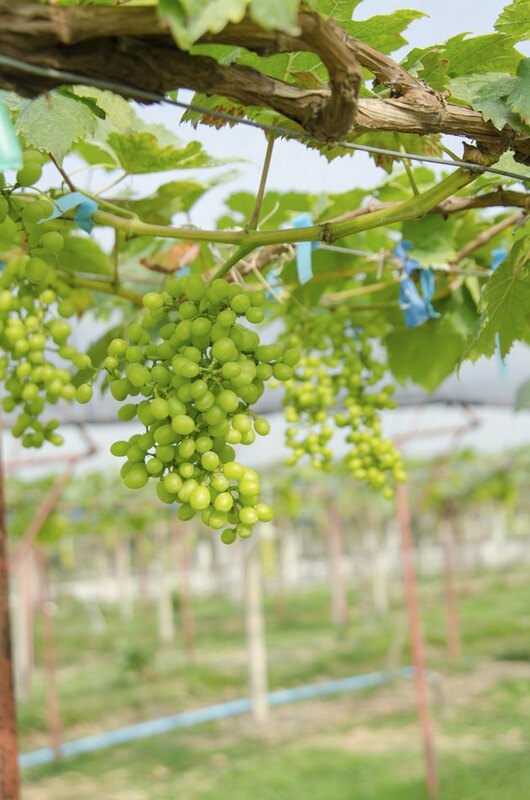 That directional position is especially important in the northeastern United States, where east-west grape rows may negatively affect fruit quality. Calculate the length the trellis needs to be, allowing about 6 to 8 feet between plants of American grape varieties and about 6 feet between European grape cultivars. Allow about 4 feet at each end of the trellis for the installation of anchoring devices. Mark the location for the trellis, using your calculations for the trellis' length. Hammer 6-inch-long wooden stakes at the beginning and end of the trellis row. These stakes also mark the location where you will put anchor devices. Place wooden stakes 4 feet inward from each end of the future trellis row, where you inserted stakes. End posts will go at the locations of these latest wooden stakes. Put additional stakes 18 to 21 feet apart evenly spaced between the end-post stakes. These new stakes mark where the trellis' line posts will go. Remove the two wooden stakes marking the locations for the trellis' end posts. Make holes for the two end posts by using an auger. Each hole should be 2 feet deep and angled outward, toward the end of the trellis row, at a 65-degree-angle. Make holes for the trellis' line posts, taking out each wooden stake marking the site for a line post as you proceed. The holes should be 2 feet deep and go straight downward into the soil. Put one 5-inch-by-8-foot end post into each prepared end-post hole, and add soil to hold each post in place in its hole. Place 3-inch-by-8-foot line posts into their prepared holes, and fill the remaining space in their holes with soil. Place one anchoring device at each end of the trellis row. The anchoring devices can be either 36-inch-long ground screw anchors or wooden anchor stakes that are 3 inches wide by 3 feet long. If you use ground screw anchors, drive each one vertically into the ground, leaving the eye at the anchor's end exposed above ground. If you use wooden anchor stakes, sink each one 2 feet vertically into the ground by using the hammer. Put on leather work gloves. Wrap one end of a piece of 10-gauge galvanized wire through the eye of each ground screw anchor or near the top of each wooden anchor stake, twisting the wire into a loop to secure it. Move the other end of the wire piece to the top of the nearest end post, with the wire forming about a 65-degree angle with both the anchoring device and the end post. Wrap that end of the wire securely near the top of the end post, making a loop around the post. Twist the wire at the base of the loop to hold it in place. Cut off any excess wire by using wire cutters. Attach one end of 9-gauge galvanized high-tensile wire about 5 feet from the top of one end post. Wrap the wire several times around the end post to secure the wire. Twist the wire's beginning end around the remainder of the wire so it doesn't come undone. The section of wire needs to be longer than the trellis' length. Secure the same 9-gauge wire to each line post by using galvanized wire staples. Hammer each staple over the wire and into a post, ensuring it is possible for the wire to slide within the staple, allowing the wire to be retightened each year. Secure the 9-gauge wire to the trellis' other end post by wrapping it around that end post several times. Bring the wire's end to the inside of the post, and twist the wire's end portion around the wire's horizontal part several times. Cut off excess wire with the wire cutters. Attach a second strand of wire to the end posts and line posts, if desired, but use 12-gauge galvanized high-tensile wire and place it 30 inches below the 9-gauge galvanized high-tensile wire. Attach the 12-gauge wire to the posts in the same way you attached the 9-gauge wire.